Last month, Waterford-born Craig Breen clinched a superb World Rally Championship title in the Super 2000 class. The 22-year old won four rallies in his Ford Fiesta on his way to the crown, defeating veteran Swede Per-Gunnar Andersson by nine points. It is his second consecutive feeder championship trophy, having won the WRC Academy Drivers’ title last year. His performance in the season finale of Rally de España was especially noteworthy. He stormed to a near four minute lead in the first day, and then used cautious tactics to make sure he crossed the line intact. According to Paul Phelan, an Administrator at Motorsport Ireland, another glorious season for Breen gives Irish motorsport plenty of hope going forward. “I think it will give Irish motorsport a good boost. It’s a great achievement for someone from this country in just over 12 months,” said Phelan. Breen was not the only Irish driver to have impressed in 2012. Árón Smith, a 23-year old Dubliner, competed in his first full season in the British Touring Car Championship (BTCC). The DIT scholar grew in confidence as the season progressed, and won his first race at the Brands Hatch curtain-call. On these shores, the Race2Race competition unearthed a hidden gem in John Greaney. With no previous race experience, this Dubliner beat 100 other hopefuls to earn a season in the Irish Touring Car Championship. Instead of being a backmarker, Greaney would in fact go on to clinch the championship. However, Phelan showed some concern about the lack of domestic motorsport coverage in the media. “The national newspapers don’t give the amount of coverage that we’d like, certainly. You would have to consider it to be a minority sport,” said the administrator. Despite his accomplishments, Breen’s year has not been without despair. Apart from his WRC commitments, Breen had a part-time drive in the Intercontinental Rally Challenge (IRC). At the Italian event in June, Breen lost control of his car and smashed into a guardrail. The impact claimed the life of his Welsh co-driver Gareth Roberts. The rally was postponed and the devastated but uninjured Breen soldiered on, but he did take a moment from his S2000 title win to pay tribute to his deceased navigator and friend. The next logical step for Breen would seemingly be the premiere World Rally Championship, which has seen Sébastien Loeb win nine consecutive championships. Due to the fiercely competitive nature of the WRC, however, Phelan has doubts about a team picking Breen up next year. “He has the talent, yes, but the big problem at that level is finance. There are huge amounts of money involved, unfortunately,” said Phelan. “The problem is there are drivers from all around Europe trying for the same few teams. It’s not a straight fight based purely on your talent (due to lucrative sponsorship deals),” he concluded. 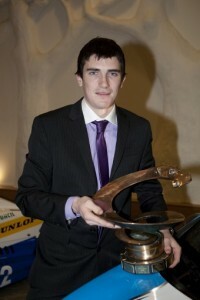 Should Breen be promoted for 2013, the WRC will forge a new path in Ireland. Brexit: A possible economic catastrophe?